Ephedra is now a banned substance in a majority of countries across the world – but this still doesn’t stop some manufacturers of diet pills trying to gain an advantage as far as consumer perception is concerned. Ephedrine is derivative of Ephedra and there are certain grey areas concerning its legality, especially in the UK. The FDA (Food and Drugs Administration) ruled that Ephedra could could not sold in any diet pill or weight loss product in the USA – the UK and Europe followed suit, but this does stop countries outside of the FDA’s jurisdiction from importing albeit illegally. 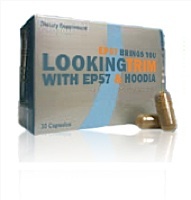 The official Ephedrine P57 website draws attention to the fact that UK customers cannot buy or place orders by telephone – any purchases have to be made online! Does this not set the smallest of alarm bells ringing. A combination of what are possibly the most talked about and infamous ingredients in the weight loss industry. Ephedrine (mentioned above) and Hoodia Gordonii – the P57 part of the brand name refers to Hoodia Gordonii and particular the raw powder and appetite suppressing molecule found within the part called P57. A fat burner combined with an appetite suppressant that supposedly burns fat while reducing hunger. Plus a whole host other side effects that are usually associated with fat burners such as; restlessness, insomnia and anxiety.